Leaving the rainforest and volcanoes behind, we traded our backpacks for fins, goggles and paddles on the Kona Coast. There is a world of difference between the east and the west coasts of the Big Island. One side is wet and verdant; the other side is dry and volcanic. 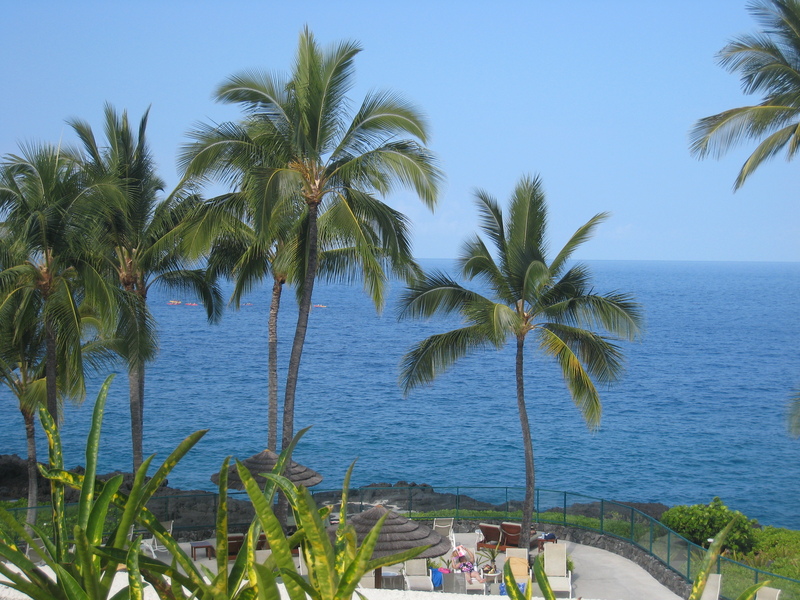 We moved our base to the Sheraton Keauhou Bay Resort on the Kona Coast, a two-hour drive from Volcanoes National Park. The Sheraton is situated on an ancient lava flow at the entrance to Keahou Bay, and is perched dramatically on black lava cliffs amid 22 green acres of oceanfront gardens. At the Napo’opo’o Pier we met our guides from Hawai’i Pack and Paddle who outfitted us with everything we needed to kayak and snorkel in the bay where Captain Cook is said to have landed in 1779. We paddled past steep cliffs dotted with ancient burial caves of the Hawaiian royalty and then glided onto the hard lava rock shore to explore the Captain Cook Monument. The Cook monument, which sits on land owned by the British Government, is a small square encompassing about 400 square feet and accessible on land by a long, rugged trail, or by boat. 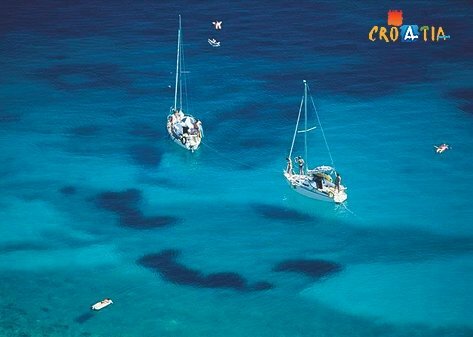 The bay is touted as one of the best snorkel spots on the coast. We spent hours, face planted in the clear water of the lagoon, snorkeling in the kaleidoscopic world of the marine sanctuary. The forty-five minute drive from Hilo to Hawai’i Volcanoes National Park leads you to one of the twenty World Heritage sites in North America and the only one in Hawaii. The Visitors Center was a good place to get our bearings and hear the ranger’s talk before we joined an easy, three-hour, nine-mile “Bike Volcano” excursion. 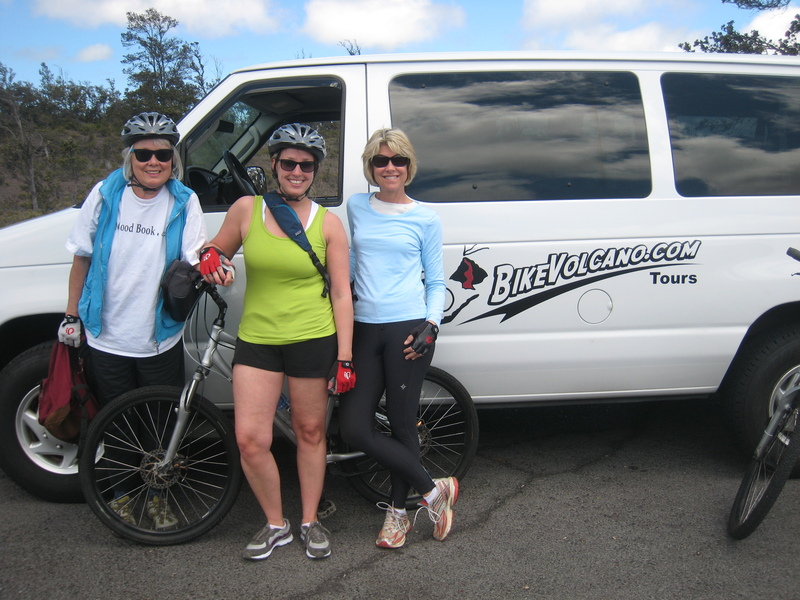 We pedaled along Crater Rim Drive, stopping to see various craters and steam vents and left our eco-friendly two-wheel vehicles to hike through Thurston Lava Tube. 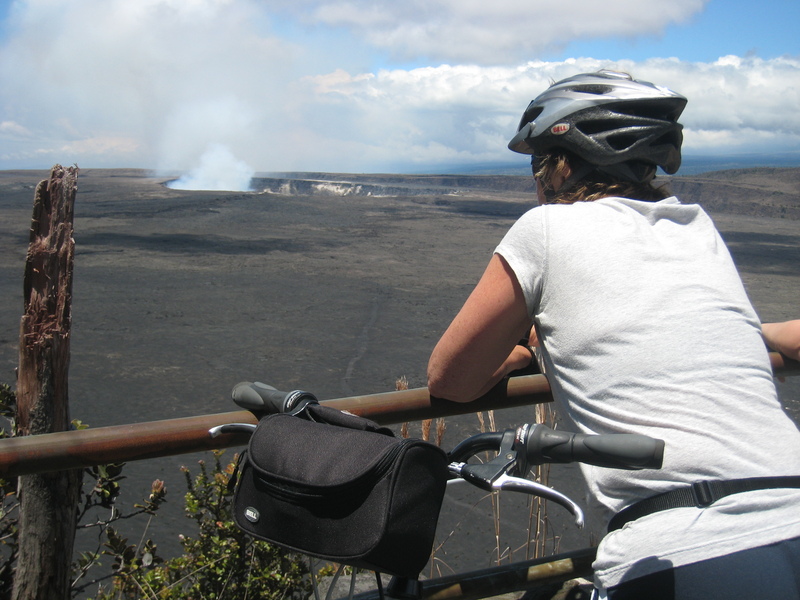 A few miles further we rested our bikes along the guard rail and watched volcanic emissions of ash and gas spewing from the Halema’umal’u Crater. We cruised through thick forests, along roads closed to traffic (sections had sunk into the crater) and amid volcanic rock fields. After a cool downhill ride the van met us with snacks, guva and passionfruit drinks and then zipped us back uphill to our cars. Grass Roots Philanthropy. Biked 3,115 miles Across America for Charity and Challenge. Bike Across America. Are we nuts? Marybeth, her 22-year-old daughter and a friend, biked 3,114 miles from the Pacific to the Atlantic and raised $52,000 for the National Osteoporosis Foundation for research and education. Their all-female campaign brought awareness to the silent disease osteoporosis which runs in their family and affects millions of American women. Six months of training. Three months of biking, and three months of recovery. Beginning in our hometown of San Francisco and ending in Yorktown, Va.
Marybeth and her daughter pedal out of San Francisco and finish 3,115 miles later in Yorktown, VA.